Virgin appears to be teasing its customers with the prospect of using air miles to grab a flight on its Virgin Galactic service. Qantas has recently unveiled an incentive deal to switch to its direct earn credit cards, which appears to have galvanised Virgin into action. 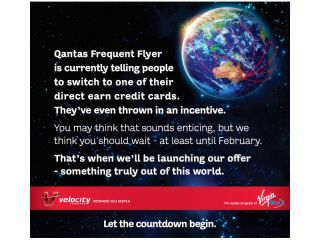 Virgin's latest advert tells customers that instead of plumping for Qantas' deal they should wait until February. Considering the high profile nature of Virgin Galactic's space flights – already being booked by the rich and famous – the implication is clear. Of course space is only technically just over 62 miles straight up – so if Virgin is offering the most direct route then TechRadar may just have enough saved up already.